i did not think weekend doritos could get worse after their last album, but hey, just goes to show that you should never assume. the longest record of their career, Apology spans 37 minutes. they tuned down the grind and violence (though theyre still there), using more mid-paced tempos and exploring their sludgier side. this makes for a monolithic record fitting as a swan song. the title track and final song is a nearly ten minute sludge affair, sending off Weekend Nachos with plodding riffs and an unexpected piano section. admittedly, i didnt come into this expecting to be impressed. knowing that they intended to break up after this, i figured this would be a band scraping at the last bits of creativity they had, creating something uninspired and redundant. and it is redundant to a degree, but i was wrong about it being uninspired. i ended up getting the album almost a month after it was released (yesterday in fact), listened through the first couple tracks without any intention to listen to the whole thing at that particular point in time, and found that i couldnt stop listening. this is simply quality material, same as Weekend Nachos has always delivered, and i was wrong to think it would be anything but. im hoping to see them later this year on their final tour before they disband. goodbye WN, thanks for smashing my face in. 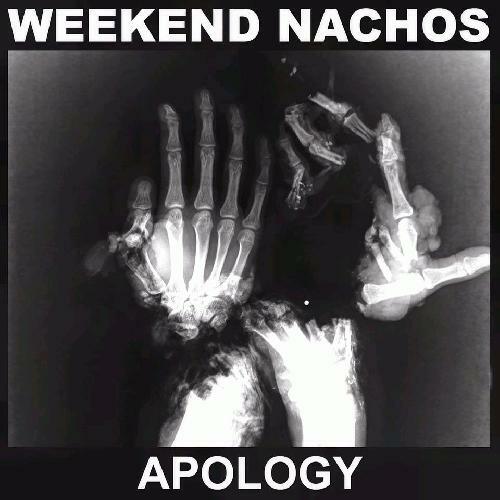 After deciding to retire after they finish their live sets for this year, Weekend Nachos released Apology, which is an appropriate end to their consistently excellent careers. This swansong is everything Weekend Nachos is about: explosive powerviolence riffs and drumming with heavy, churning sludge metal being interspersed between it, addictingly fun and menacing vocals, and doing it all with a defiant, rebellious attitude. From a songwriting standpoint, it isn't much different from what they've been doing all along, but it ultimately doesn't have to be, as the fierce aggression and seething vibe really carries the music itself, which is still as well-written as albums like Still. It's truly a shame to see them go, but they've definitely left their mark. In this case, it's a smoking crater.